I've just returned from a 4 day trip to Edinburgh, Scotland. 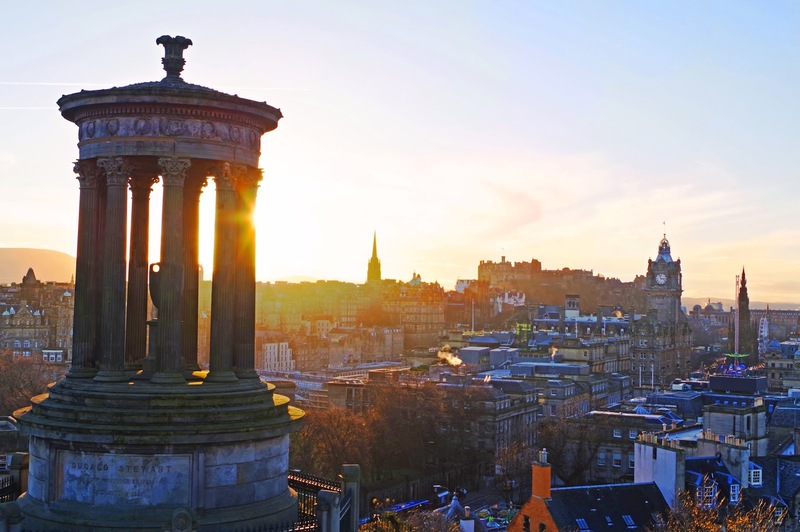 Despite having already visited 21 countries, I'd never gotten up to Scotland, so with insanely cheap flights and some holiday days to use up, I flew out to Edinburgh on Monday. 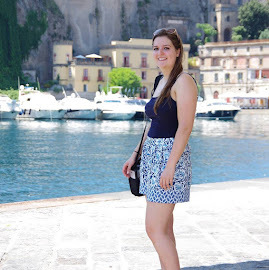 This was my first solo trip, filled with plenty of walking, exploring, photography and most importantly - good food! 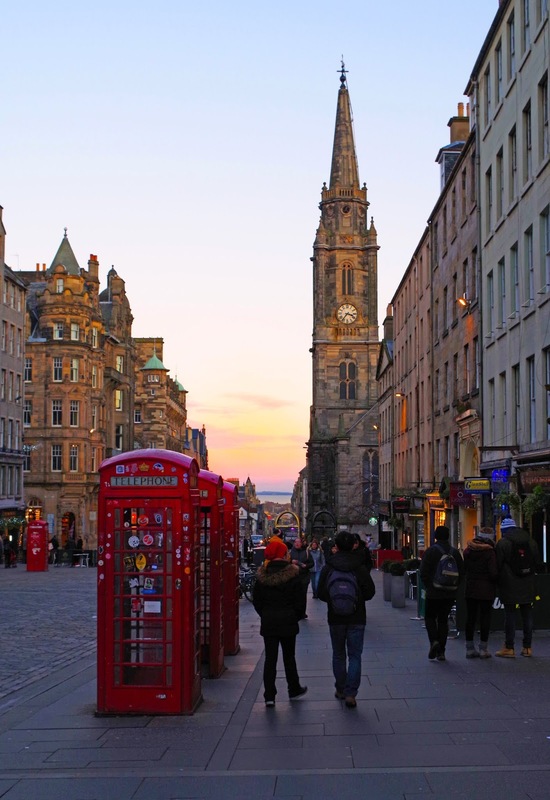 Edinburgh has a unique balance of gothic buildings, cobblestone streets, modern city life and nature, it really has it all (including a lot of hills) and being on the smaller side it's pretty walkable, meaning you get a good feel for all the elements. 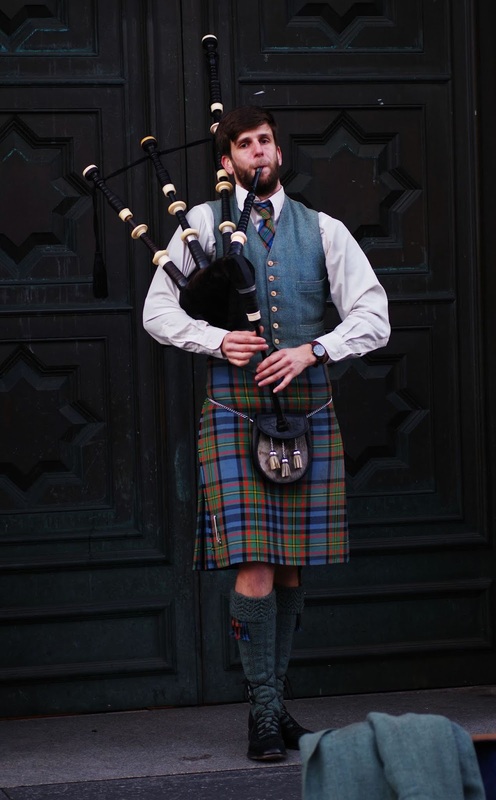 There seems to be a gentle hum of bagpipes wherever you go in the city, just reminding you where you are; Edinburgh is a place full of heritage and history and it's something you're completely immersed in during your visit. So put your walking boots on, wrap up warm (if it's winter) and get exploring! I was a little nervous, but mostly excited about traveling on my own and visiting Scotland was a super gentle way to ease myself into it - with it being part of the UK the important things for travel are all the same as England - currency, language, uber and of course phone signal for my trusty google maps. I stayed in an airbnb a few minutes from the centre and the host couldn't have been any nicer, being a veggie himself he also had some good restaurant recommendations! But actually everyone I came across in Edinburgh was so lovely and it really made my trip. My first visit after checking in was for some lunch, at the Rose Theatre Cafe - a relatively new establishment, with a vegan-friendly menu. From breakfasts to soups and sandwiches, to cinnamon rolls and hot drinks, you've got plenty to choose from at this lovely little place. 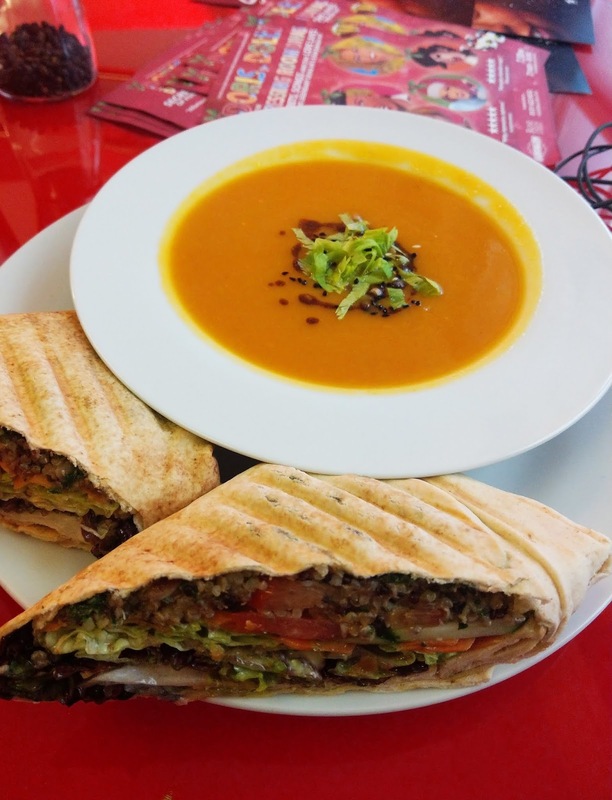 I ordered the soup of the day (spiced sweet potato) with a toasted wrap, filled with a vegan haggis quinoa fritter, pickled carrots and salad - it was super flavourful and the perfect pick-me-up after getting up at 4am for my flight and definitely worth a visit! I then continued through the centre and up the hill to Edinburgh Castle. Not only does it boast incredible views over the city and stunning architecture, but the presentation of the history of the castle was also engaging, filled with murals and short stories, it was arguably a very kid friendly way of presenting the history of the castle, which, as someone who isn't super into the nitty gritty details of history, I definitely appreciated. 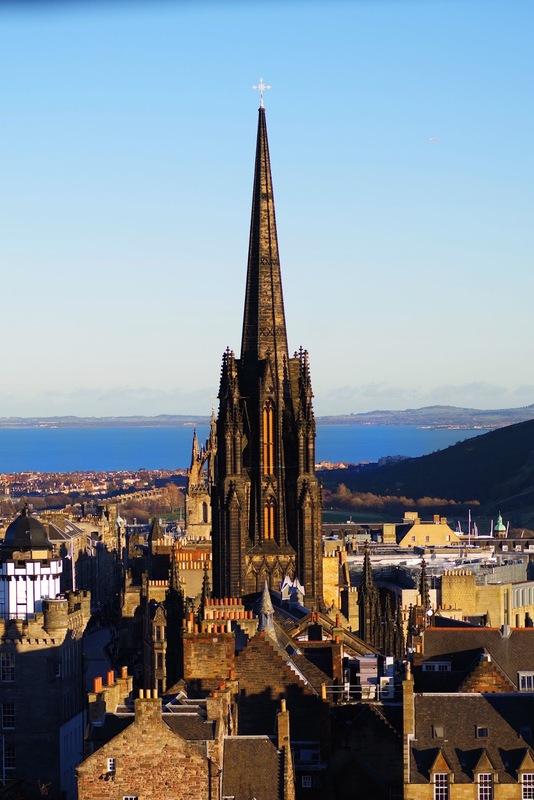 Following the street down from the castle you'll be on the Royal Mile, part of the old town, stretching down to the Holyrood Palace at the bottom of the hill. The streets are heavily populated with souvenir shops, cashmere and wool shops, gemstones and jewelry shops, as well as pubs. Walking back through the new town I found a little coffee shop Burr & Co and stopped for a hot drink - with vegan cakes and plenty of drink options this was such a little gem. 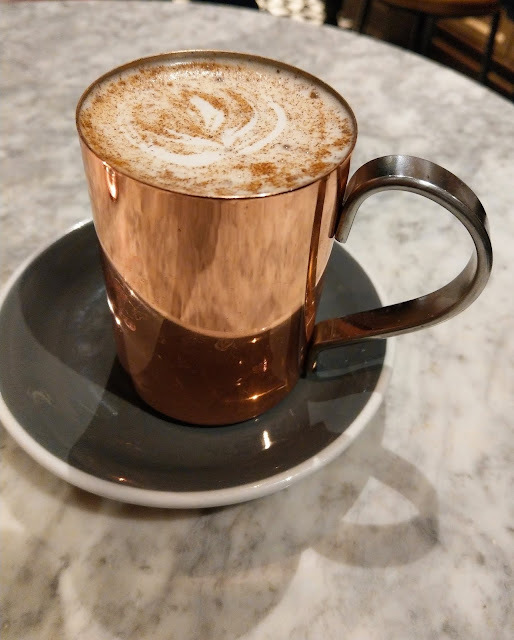 They even served horchata - spiced tiger nut milk and it was incredible, super creamy, with a perfect amount of sweet and spiced flavours. 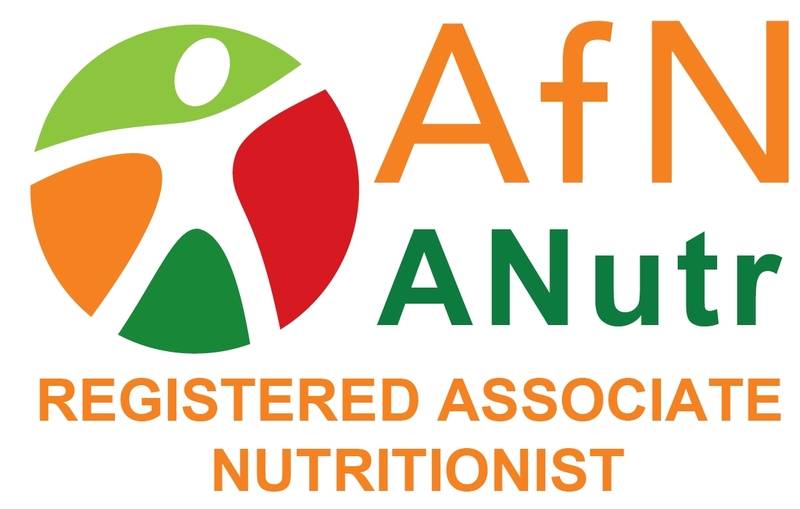 They also have a branch in London, which I may just have to track down! For dinner I ate at Hendersons - established in 1962, Hendersons now have 4 locations (3 of which are on the same street corner). 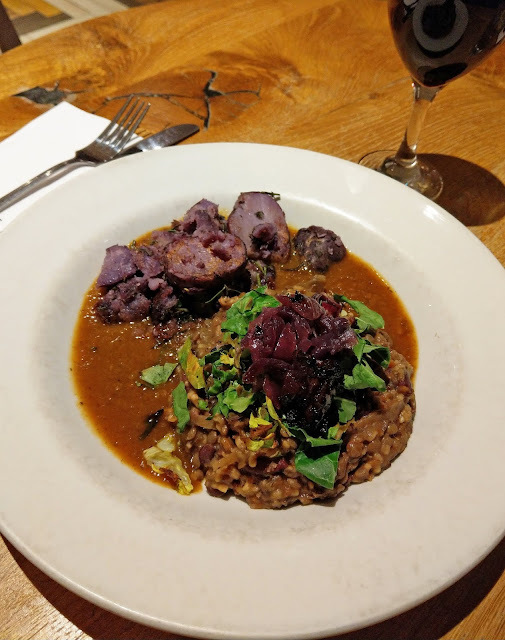 I visited the vegan branch and just had to try the vegan haggis - served up with purple potatoes, spring greens, caramelised onions and red wine gravy. The haggis itself was made up of a mince of veggies and grains, including lentils, kidney beans and bulgur wheat; I can't say it was my favourite meal ever, but I'm certainly glad I've tried it. Having never tried real haggis, I'm not sure if the quite heavily spiced flavours of nutmeg, black pepper and sage were authentic or not, but it was certainly very rich and I felt myself craving more of the sweet red onions and bitter greens to cut through this richness. For dessert I had a piece of nutty chocolate cake and it was incredible, fluffy and moist, with a delicious rich chocolate flavour. 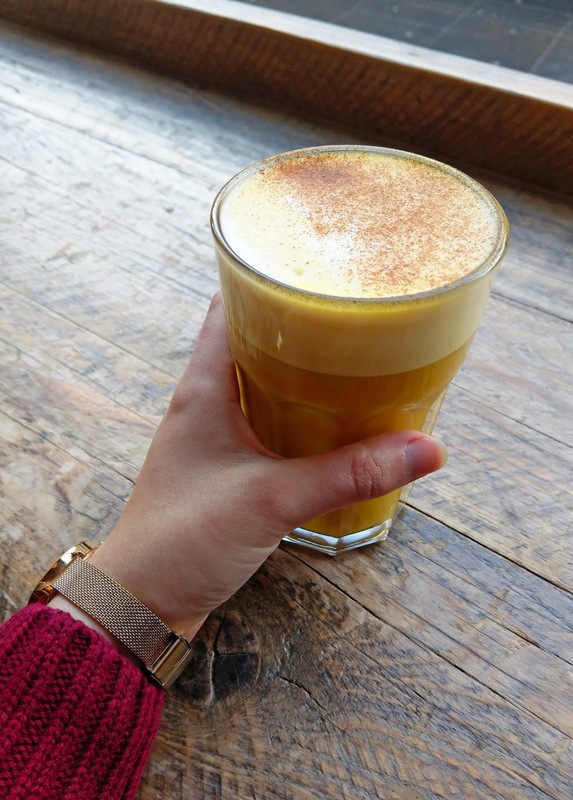 I kicked off Tuesday with a turmeric latte and hummus toast from Pumpkin Brown ahead of a full day of walking. 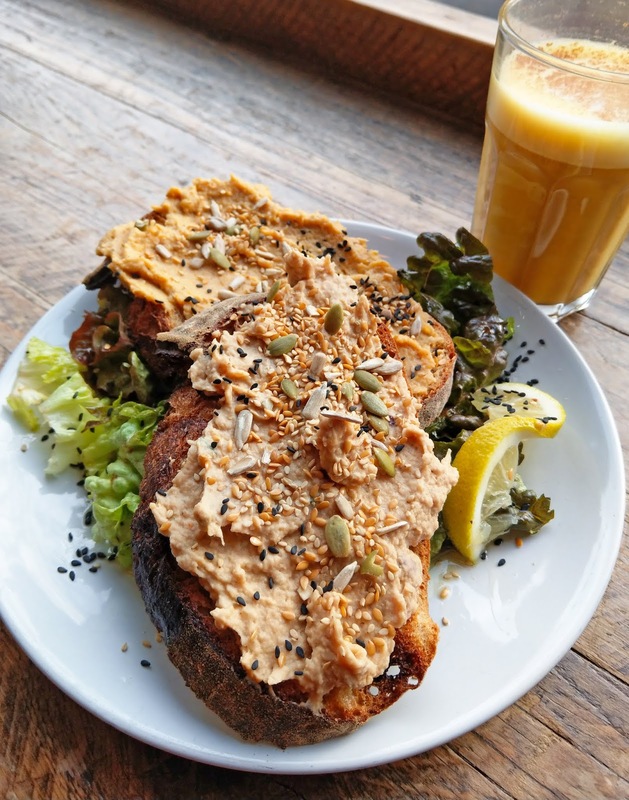 The turmeric latte was a great balance of sweet, spiced, with just a hint of turmeric flavour, whilst the toast was thick sourdough with olive oil and a combo of delicious hummus. The rosemary & caramelised onion was my favourite, a little sweet and tangy and seasoned well, the pumpkin hummus was also delicious, with hints of aniseed flavours, complimenting the slightly sour bread. The portion was pretty generous, the crispy wedges of bread lathered with thick hummus and definitely substantial enough to fuel me through the morning. The smoothie bowls also looked incredible and if it was summer, I definitely would've tried one! 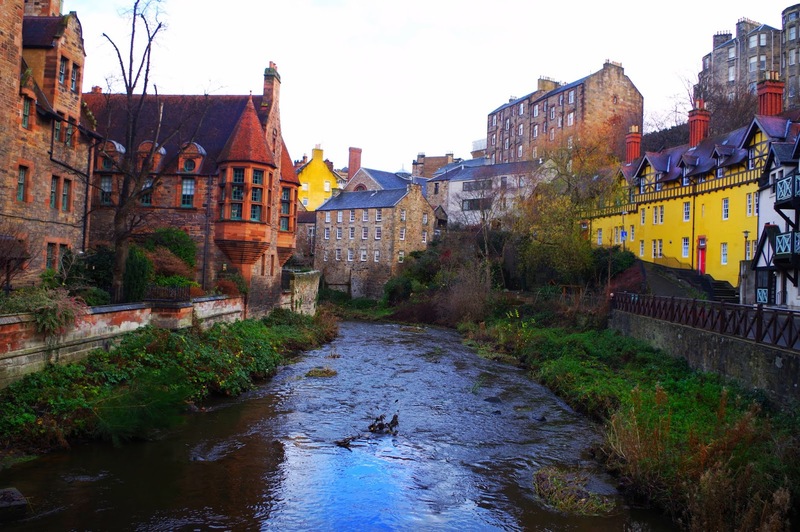 After breakfast I made my way down to Dean Village, for a wander along the Water of Leith Walkway, a little picturesque village with a river running through. I got a little distance along the walkway before I found that a section of it is closed off due to to land movement, making it unstable. I came off the path and walked through the village, looping back to the path along the water further up, passing the modern art museums along the way. Remnants of autumn still remained, with winter not quite set in yet and I can just imagine how beautiful it is will the colours of summer and autumn illuminating the path. Lunch was at Yeni Meze Bar, with 3 for £10.50 on the dishes (plus warm pitta), with plenty of marked vegan options to choose from you can't go wrong. I went for the dolma, lentil soup and warm shaksuka. 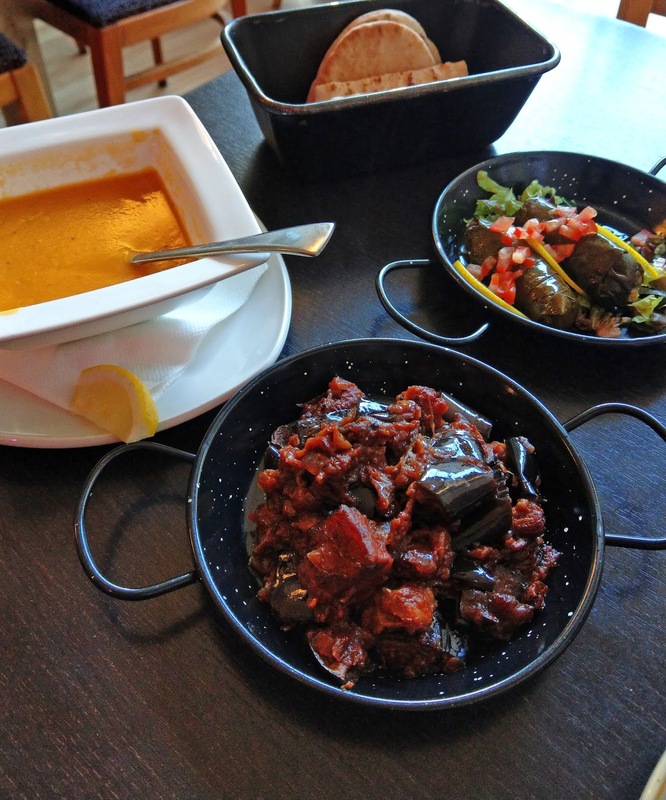 The shaksuka was one of the best aubergine dishes I've had, incredibly silky and melt-in-your-mouth, with warming flavours of onion, garlic and cumin and I would highly recommend it, along with eating at Yeni! Following a late lunch I headed up to Calton Hill, arguably one of the most famous viewpoints in the city, complete with a number of monuments and 360 views over the city, it's truly a breathtaking sight. I went just before sunset, which was stunning, but any time of day, considering it's not too cloudy would be a good time to visit. 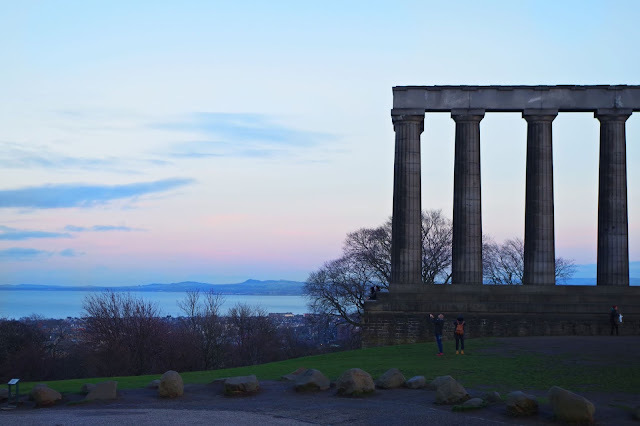 On one side of the hill looking beyond the Dugald Stewart monument you've got the classic city scene at twilight and the other, looking out to the water past the national monument with a soft pastel sunset. Dinner on tuesday was probably one of the best and most unique vegan meals I've eaten and the first place I wished we had one in London. Harmonium is a vegan restuarant/bar slightly further out the city, I got an Uber there, but on a warm summer night it would be perfectly walkable. I opted for 2 starters and a side dish off the menu - I love having tapas-style meals, you get to try more off the menu and it makes it more interesting (and delicious!). 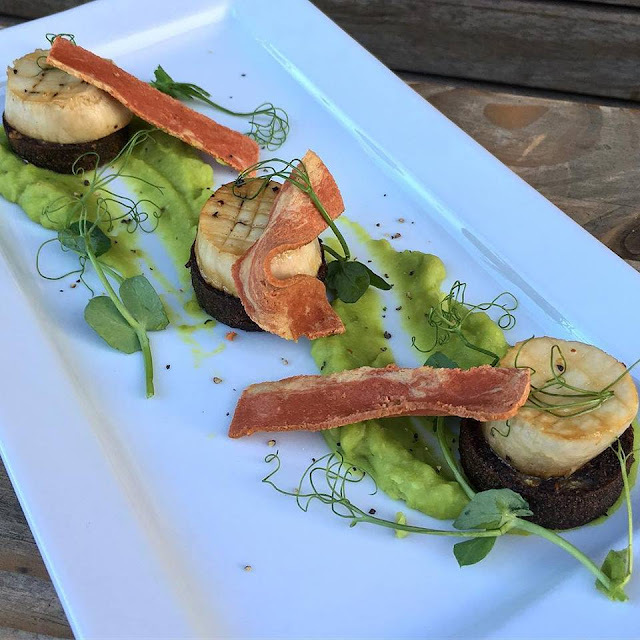 The first was king oyster mushroom scallops, with vegan black pudding, on a pea puree with vegan bacon and watercress, this meal was simply stunning, a wonderful combination of flavours and textures that all complimented each other so well. It was quite dark so I've shown Harmonium's picture below to do the dish justice! 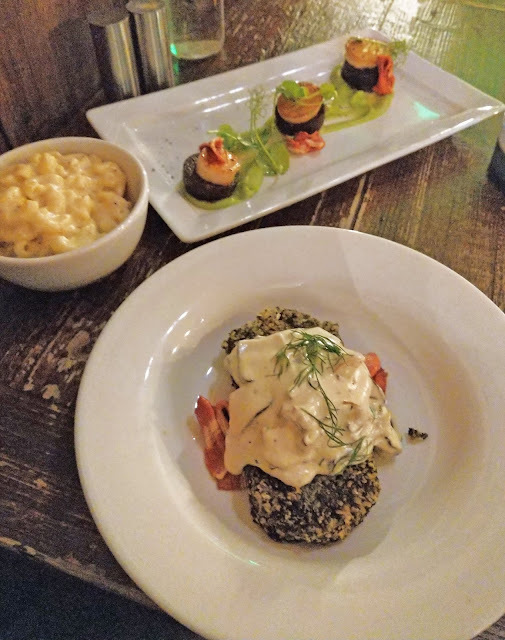 The next dish was a lavercake (a Welsh seaweed & oat cake), with bacon, mushrooms and a garlic cream sauce, I was so intrigued by this dish, having never heard of it before, it was savoury, well balanced and incredibly delicious! The mac and cheese at Harmonium is undoubtedly in my top 2, it was creamy, cheesy, silky and velvety, it was everything you want in a mac and cheese and it just happens to be vegan. 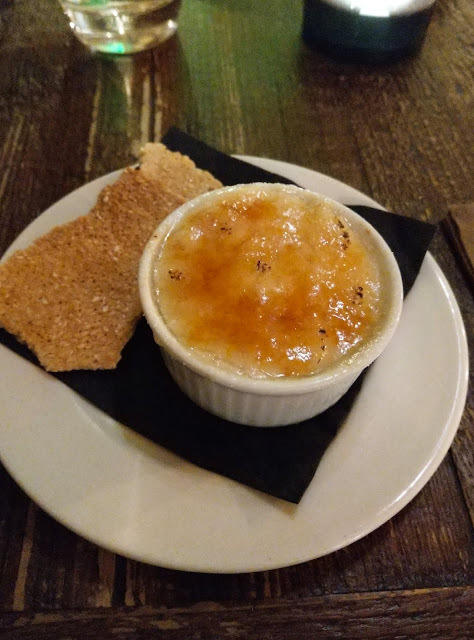 I was feeling optimistic about how full I was when I looked at the dessert menu, but I just had to order the miso creme brulee, complete with a sweet & salty flavour, a crisp top and sesame biscuits, it was nothing short of perfection, as was the whole meal. 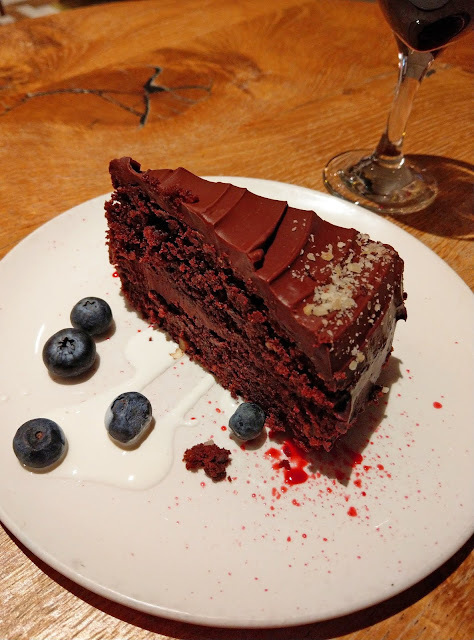 The menu was so carefully thought out and I found myself super impressed with Harmonium, not to mention surprised at the opportunity to try new foods, which is quite a rare feat for a foodie like me. 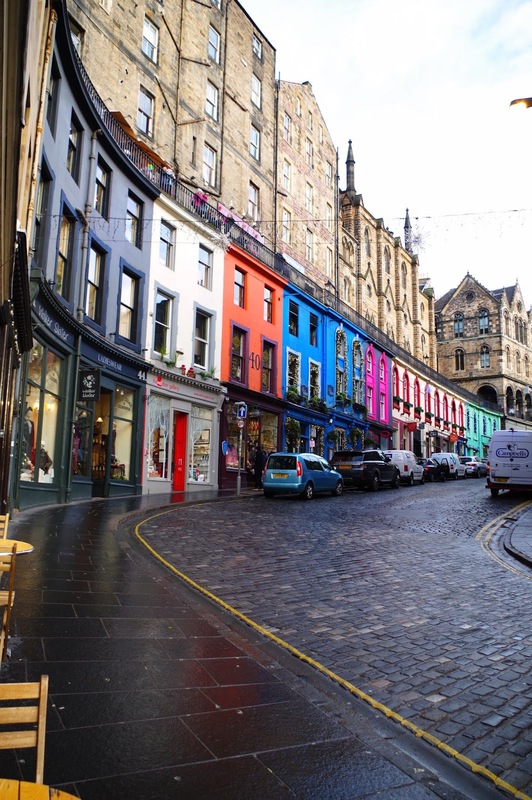 Harmonium is a can't-miss if you're in Edinburgh! 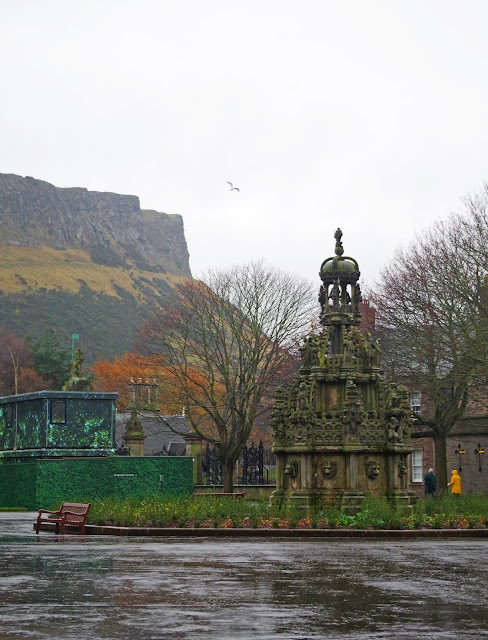 I was planning on hiking up to Arthurs seat on Wednesday, but the weather had other plans, I'd read that it gets pretty slippery on the walk up, not to mention the low clouds that would've impeded the view of the city anyway, so I took it easy, had a late breakfast and visited the Holyrood Palace. 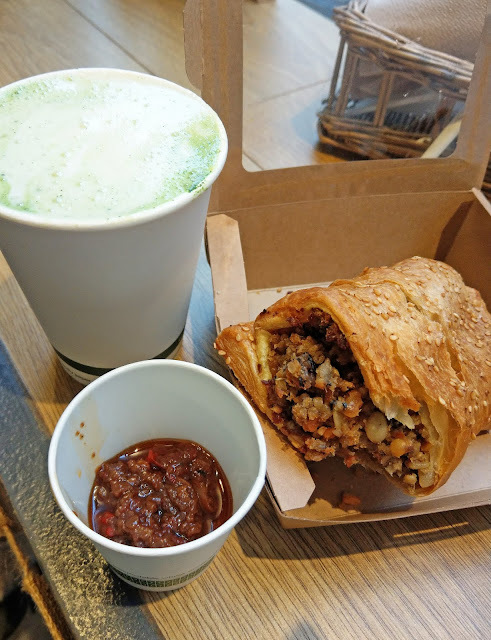 Because of the rain, Edinburgh Larder was completely full, so I went next door to the deli and got a hot vegan haggis roll with chili jam and a matcha latte. It was like a cross between a sausage roll and a nut roast wellington and it was super delicious, especially paired with their homemade chili jam. As it was a to-go place, everything was in take-away containers, but it was all compostable which is fantastic, they also had vegan cakes, as well as soup should you fancy something else. The palace entry comes with a free audio guide, which talks you through the rooms of the house, from the incredible tapestries to the history of its occupants. The palace is the Queen's official residence in Scotland so there's plenty to learn about the palace and its functions. It was super festive, with Christmas decorations throughout and was the perfect place to visit on a rainy day. Unfortunately, in the winter the gardens are closed during the week, but you can have a good peek out the palace windows and through the gate in the abbey. You can't take any pictures in the palace itself, but in the courtyard you can, which is paired with a view up to Arthurs Seat. 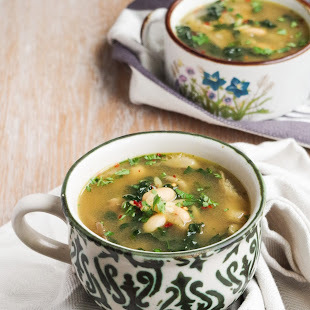 Just up the hill from the Palace is the Holyrood branch of Hendersons, a vegetarian place that has tons of vegan options - some menu items have veggie/vegan versions, so just be sure to specify which you're wanting. 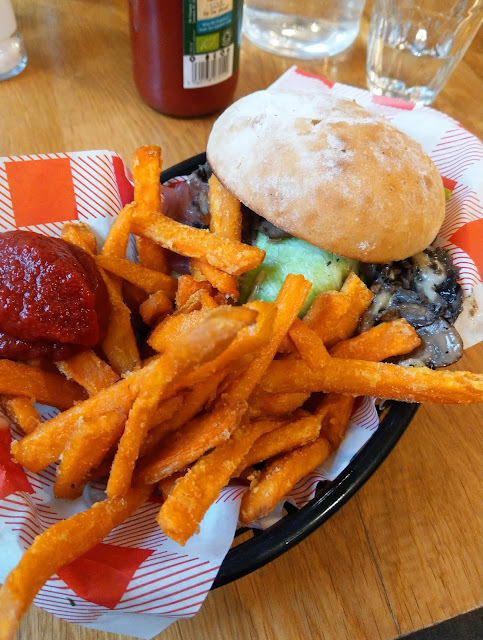 I ordered the pulled mushroom roll, with pickled onions, vegan cheese and a side of sweet potato fries. I couldn't fault the taste, but it was a bit like a sloppy joe and kind of impossible to pick up, which would've been alright to eat with a knife and fork, if the roll was on a plate, rather than a basket lined with paper. I'd definitely order something a little easier to eat next time! I also had a turmeric latte, which was the perfect winter warmer on a rainy day like this one. The Christmas market spans 4 levels in Edinburgh, complete with market stalls, food, drinks and attractions too, it's super festive and lovely to just wander around. 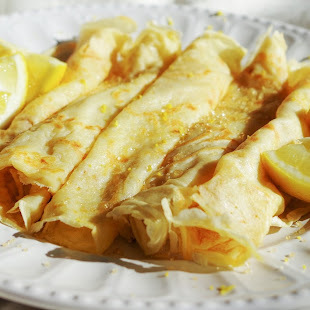 I didn't stop to eat there, but I did spot a sign for vegan pizza, as well as potato skewers and a vegan galette, so its safe to say that there will be something to eat when you visit. 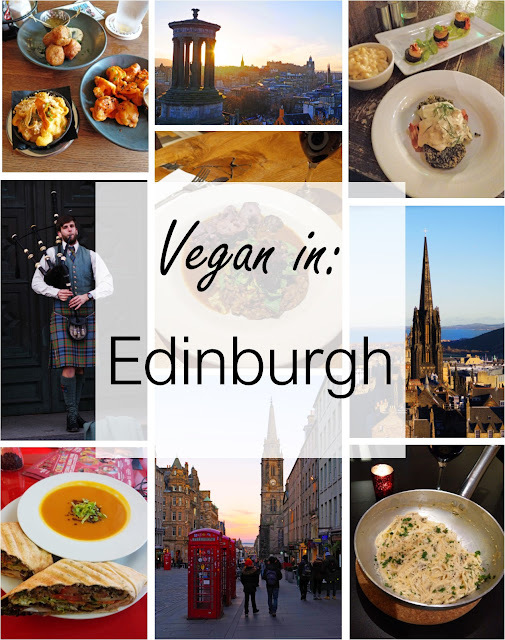 For my last night in Edinburgh I'd been looking at the menu for Nova Pizza, a veggie Italian Restaurant, where everything on the menu can also be made vegan. 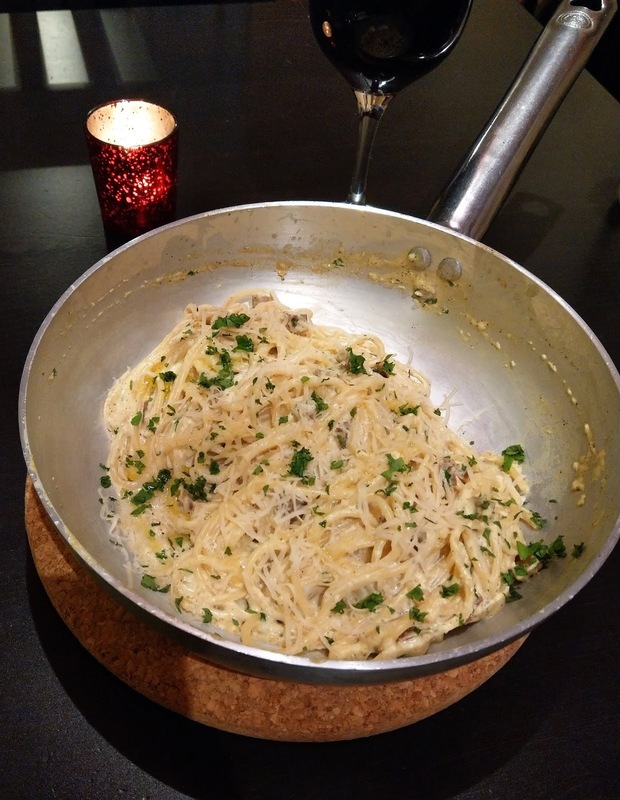 It looked a little pricey, so I wasn't sure about it, but speaking to my airbnb host who just happened to be vegetarian, he convinced me that I just had to try the carbonara. I'm so glad I took his advice as the carbonara was incredible, silky and creamy with bits of smoky seitan and as to fulfill my pasta dreams even more, they served it in the pan! I ordered with a side of creamed spinach, which had shavings of vegan parmesan and nutmeg, it was just dreamy. The other menu options sounded incredible and this is another I wish we had in London! The restaurant was pretty busy when I arrived and luckily I'd managed to book a last minute table, as every table was full by 7.30. 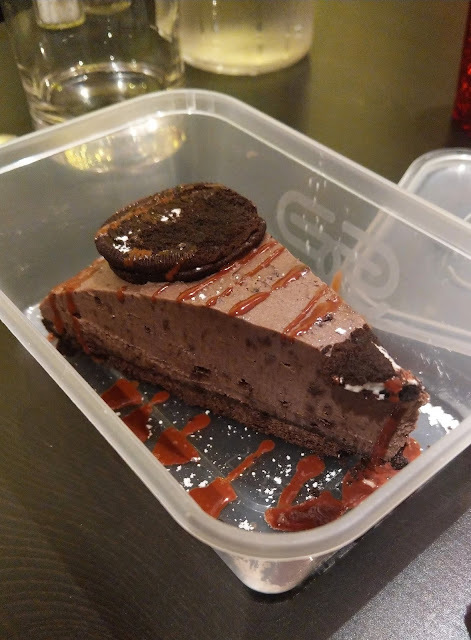 I was far too full for dessert (a half portion of pasta would've been enough), but I just had to try the oreo cheesecake, so I took a slice for breakfast the next day. Starting off day 4 with a slice of oreo cheesecake a vanilla chai tea in bed, it was a relaxing end to my trip. I walked up to the royal mile and did some window shopping, as well as checking out Victoria Street - the main inspiration for Diagon Alley. 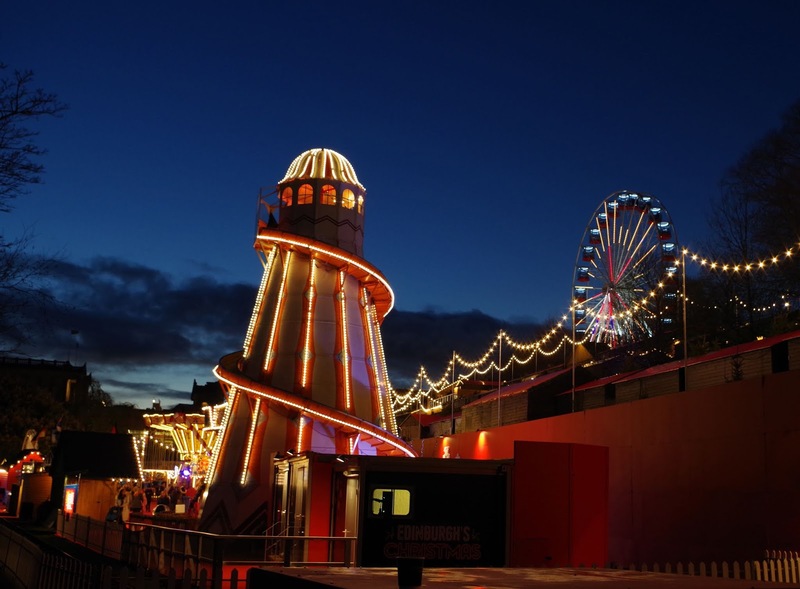 Complete with colourful buildings and 3 Harry Potter shops, this is something that can't be missed. My final stop before I headed to the airport was Paradise Palms, who have a veggie menu by the Lucky Pig. It's a similar concept to the Spread Eagle in London, who have food by Club Mexicana, decorated in tropical form and with an exciting looking cocktail menu, I'm sure this place is packed in the evenings, especially being so near to the uni campus. I orderd off the sides menu - vegan chipotle mac, buffalo cauli and tofish bites. 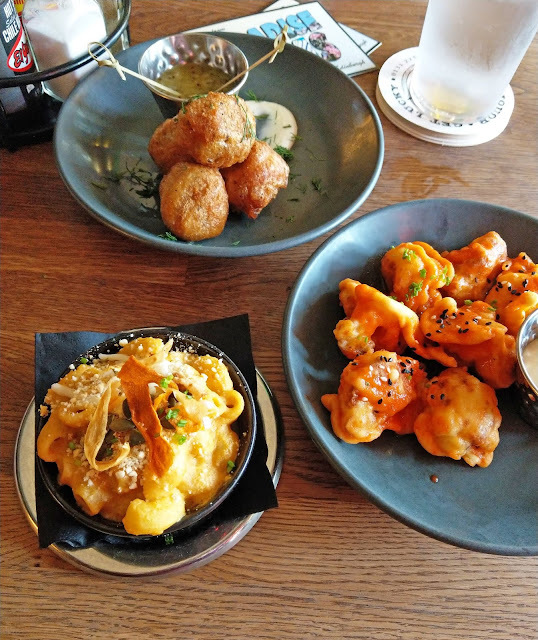 The mac and cauli were super delicious, with great flavours, the tofish bites, whilst crispy were filled with mashed tofu and the texture was a little too soft for me, but the kiwi dipping sauce was pretty innovative and somehow worked with the tequila beer batter. Edinburgh was truly incredible and filled with some insane food options. One thing I aim for when choosing food is trying new things, I love exploring new flavours and textures and it truly reminds you how little of the world's dishes we have actually tried - despite being their vegan counterparts I got to try a number of new foods on this trip; haggis, black pudding, scallops, lavercakes, creme brulee and horchata. So it was a trip of plenty of walking, trying lots of new foods and exploring a new city and it was wonderful. 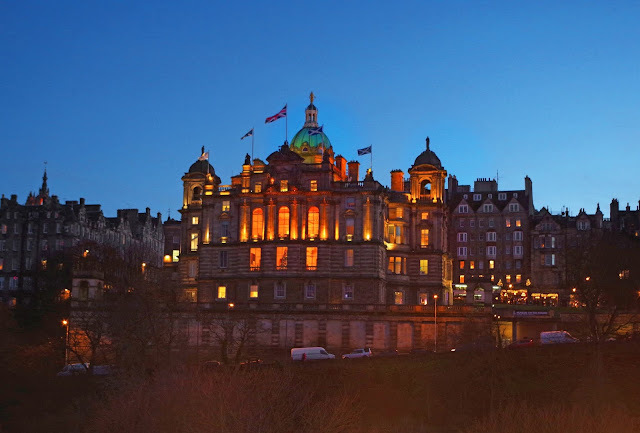 If you're ever visiting Edinburgh do have a visit of the places above, and if you've already been, where was your favourite place to go or thing to do? I also stayed in an airbnb, I find they're a great way to see new places and meet new people. I had in a room in someone's flat, but you can always rent the whole place to yourself - if you sign up using my referral link here, you'll receive £25 off your first trip (I'll also get a little credit once you book your first stay).